With advanced static emulsification technology and continuous production, the EXPLOENERGY bulk emulsion plant is used for continuous, automatic manufacturing of bulk ammonium nitrate based emulsion. The EXPLOENERGY bulk emulsion plant is capable of production capacities up to 30 metric tonnes per hour. Incorporating high levels of intrinsic safety, the control system of the EXPLOENERGY bulk emulsion plant includes power control, PLC control system, video recording, and a variety of sensors and controllers. It is suitable for a wide range of environmental conditions, including indoor applications in extremely cold areas. The composition of oxidizer phase and fuel phase are strictly controlled according to the formulation inputs and an emulsion matrix of stable quality is produced. Production controls using frequency converting control on the oxidizer phase, fuel phase and emulsion system, mass flowmeter monitoring and PID closed loop control on flow and temperature ensure that the output meets the desired formulation parameters. The production process is protected by alerts and interlock protection features on over temperature, over pressure, liquid level and density. Recorded data and video are saved and displayed at the control station through networked communication protocols. With advanced static emulsification and continuous production, EXPLOENERGY bulk emulsion plant is used for producing bulk emulsion automatically and continuously. EXPLOENERGY bulk emulsion plant improves intrinsic safety and enables large capacity up to 30t/h. The complete control system of EXPLOENERGY bulk emulsion module includes power control, PLC control system, video recording, various sensors, and controllers. It is suitable for indoor applications in extremely cold areas. With frequency converting control on oxidizer phase system, fuel phase system and emulsion system, mass flowmeter of E+H, and PID closed loop control on flow and temperature; the composition of oxidizer phase and fuel phase are strictly controlled according to the formula and emulsion matrix of stable quality is produced. The production is protected by alerts and interlock protection on over temperature, over pressure, liquid level and density, recorded data and video are saved and displayed in the office through network. b. Convenient capacity adjustment, there’re no temperature rise during emulsification, mechanical energy is transferred to emulsification energy completely, which eliminates heat accumulation in traditional rotary emulsification unit. c. Application length of static mixer is only 8cm. 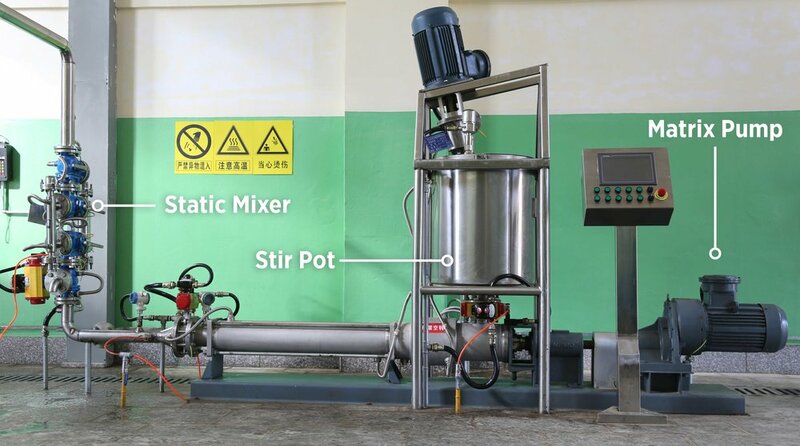 Mixing elements consist of 24 layers with distance less than 1mm (far less than critical diameter of explosion and emulsion thickness (12mm) on steel belt); the mixer is also a detonation trap and could trap detonation between upstream process and downstream process. e. Interlock systems on product level, unusual voices, pressure, and temperature are applied. f. Produced emulsion matrix has passed test serious 8 of UN dangerous goods test and could be classified as 5.1 Oxidizers; intrinsic safety is greatly improved. Production capacity is adjustable in the range of 20-30t/h. Stationary personnel for the whole production line is controlled with a maximum of 4 persons. High quality emulsion is produced from macromolecule emulsifier and is of excellent bump resistance performance and long shelf life: shelf life is up to 12 months. Temperatures of oxidizer phase and fuel phase materials are low: oxidizer phase temperature: 75～85℃, fuel phase temperature: 50～65℃. Bulk emulsion plant is of low energy consumption and steam consumption. Stir pot power is 3kw. The bulk emulsion plant uses mass flowmeter for metering, so the ratio of oxidizer phase and fuel phase are measured and tracked. Interlock protection system such as over temperature, over pressure, overload, medium break, motor phase loss and liquid level limit are set on key equipment. Complete video monitoring system and hard disc recording system are applied.